This shawl kit contains the Lavender Fields shawl pattern by Natalie Servant, 1 skein of Yvieknits Yarn BFL/Silk Select Lace in the Persian Violet colourway, and 1 silver shawl pin from Fancy That – Creations by Francine. The Lavender Fields shawl is a wavy-edged triangular shawl inspired by lavender fields and flowers. There is enough yardage in this skein of BFL/Silk Select Lace yarn to knit the large version of this shawl. BFL/Silk Select Lace is a 2-ply slightly thicker laceweight yarn that contains 80% superwash BFL (Blue-Faced Leicester wool) and 20% silk. Each skein is approximately 100 g and 800 m (874 yards). The Persian Violets colourway is a mix of different shades of purples ranging from a grape purple to a lighter pinky-purple. The filigreed circle shawl pin is made of Tibetan silver and is 2″ in diameter with an attached silver-plated stick pin. 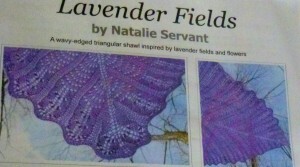 There is one example of Lavender Fields shawl on my gallery page near the top knit using the same yarn.